Mersin, Turkey is a part of the Logistics Plus® network. This office provides air and ocean freight forwarding, inland ground and rail, warehousing and distribution, project cargo, import/export, and global trade compliance services. Mersin is a large city and a port on the Mediterranean coast of southern Turkey. It is part of an interurban agglomeration – the Adana-Mersin Metropolitan Area – and lies on the western part of Çukurova, a geographical, economical, and cultural region. According to the 17th-century traveler Evliya Çelebi, the city was named after the Mersinoğulları clan; another theory is that its name originates from the myrtle (Turkish: mersin) which grows abundantly in the region. 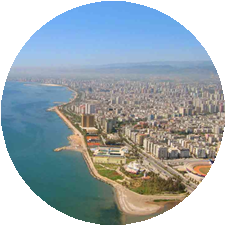 Mersin is an important hub of Turkey’s economy, and Turkey’s largest seaport is located in the city. Mersin’s nickname within Turkey is “Pearl of the Mediterranean.” Turkey’s largely free-market economy is increasingly driven by its industry and service sectors. The automotive, construction, and electronics industries are rising in importance and have surpassed textiles within Turkey’s export mix. Mersin is also home to a Logistics Plus office where we proudly serve both small and large businesses throughout the region. If you’re located in Mersin, or any other surrounding community, your friends at Logistics Plus are ready to provide you with local, domestic, and global transportation and logistics services. Additionally, we’ll show you how our people in Turkey put the “plus” in Logistics Plus by doing the big things properly, and the countless little things, that together ensure complete customer satisfaction and success!